We started as a group of 8 [ Varun,Rama,Devesh,Krishna,Abhishek,Sudhir ( Rama's room mate) , MohanRaj ( Vishal's friend) and Myself ]. Mohanraj is from satur ,did his graduation from REC Trichy - 2004 passed out and after small conversation we could identify a lot of common friends , very small world indeed .We have booked Rajahamsa bus from Majestic to Dharmasthala .Since this platform (No:23) is near to the exit , buses started right on time.Else buses starting from interior platforms from majestic used to be delayed atleast 30 mins to come out.We reached Dharmastalla at around 5 AM in the morning and this famous pilgrimage spot seems to take 10,000 visitors per day. But it was clean showing no trails of such a large population. Quality Food and accommodation are provided free of cost and it is also a excellent hill town. Why the hell will anyone hesitate to come here then . During the previous treks ( lot smaller than this one) i had knee pain and so i assumed will get it here too. So my strategy was to "Pray for the Best and Plan for the worst" .I had taken iodex spray and also a new backpack (Rs 2200) .This seems to distribute the weight lot better than ordinary ones and even though the luggage weighed several times than the previous ones ( as it is a 2 day trip) , it was lot easier to carry .Thanks to Devesh for getting this.Apart from common rations have taken couple of extra chocolates and RedBull so as to continue without disturbing the team. I insisted on carrying Tang juice instead of mineral water which was ruled down by the central committee . Actually the strategy to push to the limits and resort to external help only when warranted . As it has worked previously i too followed it. Took a strip of pain killers to use in case of emergency. We didnt have time to visit the temples here.We refreshed in the public rest rooms and had breakfast. 6:30 AM was too early to have any food and had a light breakfast. We need to reach a village called Shishila which is 30 Kms from Dharmastala. One bus was schedulled to leave at 7 AM and we boarded it.Though there was only one passenger apart from us , driver started right on time and we reached Shishila at 8 AM. We had called up Gokhale ( a contact in shishila whom u can read about in many blogs) to prepare breakfast and varun went to collect it. It was cute little village with not more than 10 shops.Hardly could 100-150 families live around. Once Varun returned we started our trek right from Shishila busstop at 8:30 AM.We need to go through a proper road for around 4 KM from where we have to enter the forest cover. Its a high probability you can miss this entry point if you are not backed by a guide. There was stream with a small temple (nothing more than couple of statues on a platform). Entry point is next to the temple and there is a stone with mark 2 on it and the road sharply turns to the left. It was exactly a 9:30 AM when we reached this spot.Had 2nd breakfast here and entered the forest.First section of the trek is through a not so dense forest and it was not so steep and path was visible. Nothing challenging here except for the red soil which is very slippery some occasions and abundant leeches.There were couple of water streams in this stretch and crossed the other team from Citrix in the second water stream.Fill up the bottles with water since after this we could see only one place where we could get water and that was also risky one.This area is also highly infested by blood thirsty leeches. One curious point to note is that i have never seen leech stuck to my skin so far in the past and this time too .At max when i look for there will be few of them trying to ascend my shoes and i will get rid of them.Adding to i havnt taken heavy precaution either. Anyway its good to know that my blood is not thier favourite dish :).But Varun was on the other end of this spectrum that leeches were so fond of them. One logical reason could be is that he used to lead from the front and might be making him a prime target for leeches. At around 11 AM we entered the grass land and this section of grasslands are completely mesmerizing.whenever we went out of energy we would have Tang juice , 5 stars etc .It was quite refreshing to walk through to this serene surroundings. Weather was awesome during this .It wasnt too sunny and it wasnt raining either. Both of this could make the conditions worse extract much of you energy for same given task. After the grasslands comes the steep hills with grass cover alone its was quite a bit of task to climb them.There was steep rock section which very difficult to scale . Later came to know that the other group could manage this section with a rope.It started to drizzle once we scale this rock and we decide to have our lunch here.Bread with peanut butter and jam.During the previous section i have lost my rain coat , which was held at the top of the backpack loosely with the strings . We couldn't find it on the return either :( . After this point the task is getting harder and harder.After short 20-30 mins climb we could reach large rock providing rain shadow region.This seems to be the best place to camp and there is water source near by.But it was already occupied by a group and discussed with chennapa who was guiding them on which place was good for to tent. He asked us to go up and that there could be more camping site .When asked for routes he gave some fuzzy answer and we decide to test our luck on it. After climbing steep path for another 30 minutes we were left clueless on the further course to take , for there was not single path on these steep hill. Varun , Rama , Mohanraj went up more locate the path and others stayed behind. There was feeble mobile tower available there and Devesh was interested in scraping a "We are lost" message in FB though his mobile. Whiled of 30 mins by talking of Hollywood stories in which heros was lost in a unmanned island or forest without any help. 3 people who went to find out the path returned back without any conclusive answers. All of us trek down for 20 more minutes reached the camp site where chennapa was stayed and asked him to accompany us to find a new camp site (off course by offering some money).Devesh and Krishna stayed back to communicate with the other citrix gang. He agreed and took us to a camping site some 30 mins climb up and it was almost 4 PM now .The actual turtle and stove was still 1.5 hours climb up.Now Varun & Mohan again went down again with chennapa to bring back Devesh and Krishna back and also got some kerosene from chenappa.We erected two tents .One was safe surrounded by rocks but another was on a slope and barely 10 feets after the tent ends there was a steep valley. Myself and Sudhir went to collect some wood for camp fire and without any exception everything in the forest was wet.We collected few logs and everyone was involved in the process of igniting the camp fire. We used papers,plastics,couple of match boxes ,dry grass ,camphor tablets for around half an hour and we couldn't ignite the fire. After expending all that would burn we called off the efforts.Then attention turned towards dinner. Everyone deserved a hot dinner after a tiresome day . Myself and Varun started of the efforts with two camphor stoves.After around 15-20 mins , 12 maggies were made and was shared for 8 people. Any food served hot would be delightful in that climate. After dinner or so @ 8 PM Varun & Mohan went to sleep in one tent and other tent was made into club. Three torches were hanged down from the top of the tent and they swayed in air making a disco light efforts which was precisely suited for our card game. Devesh / Abhishek pair was invincible in the games and after around an hour or so i left to the other tent for sleeping. Tent was not placed in a smooth surface and more than all it was in slope as well which was not that convinient for sleeping.At around 5 AM it was too much inconvenient and all of us in our tent woke up and came out and checked. The whole tent was moved down the slope due the weight of bags and we were very close to the valley. There was small rock which prevented the tent from further movement else we would have all thrown out of the cliff. We kept the bags out rearranged and tried to get some more sleep. Early morning Varun,Rama,Mohan & Sudhir joned with the other gang lead by chennapa and went to explore the top .Rest of us stayed back and continued our sleep.This gang returned by 9:30 AM and then we prepared hot MTR and started our return journey by 10 AM.Within 5-10 mintues of the journey while climbing down a small rock i twisted by ankle.I had severe pain initially and it gave away once i sprayed iodex. I was lot of careful for the rest of the journey and one injury can spoil the entire gang.Though i had a little pain i resisted stopping and kept on walking.We didnt have any rest more than 10 minutes and reached the bottom of the hill at around 1 AM . Initially we had booked return tickets starting at 10 PM but now it was planned to take a bus as soon as possible and reach bangalore in night and have a good sleep at home. Some of us were interested in sticking to the original plan and to enjoy some waters around dharmastala. Soon after coming out of the trek there was small stream and as soon as i saw it i removed by backpack/shoes and lied down in that stream .It was amazing and refreshing.Since we were running out of time i left the stream half halfheartedly in 5 minutes and started on foot towards shishila. After arournd 1 hour we reached shishila and meanwhile varun has bargained a jeep to carry us to dharmastala for Rs500. There was small restaurent in the bustand we bought out all the fish fries there.Then had lunch in Gokaley's house and left for dharmastala.The thing i dislike the most about karnataka the most is their sambhar.Atleast i know what to expect , Sudhir ( from Andhra ) was visible agitated to find a sambhar without any dhal and meals without any chutney :). Our entire gang spans across the whole india ( Tamilnadu , Andhra,UP,Delhi ,Nepal) & hence Hindi was the binding language here. Though i couldnt get the core meaning of some funny dialogues i could enjoy it.தமிழ் மக்களே காலேஜ்ல subject படிக்கலனாலும் பரவாயில்ல ஹிந்தி படிச்சிருங்க . எழவெடுத்த அரசியல் கட்சிகள் பேச்சை நம்பாதிங்க. There was bus leaving to Bangalore at 4 PM and we canceled our old tickets and boarded this one.By this time my ankle pain has grown up. 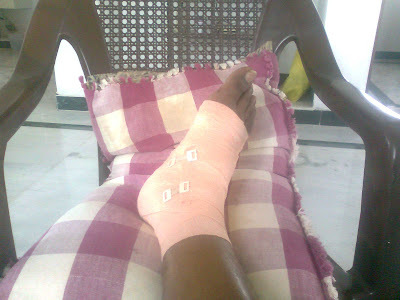 After a funny trip we reached Bangalore jus before 1 AM.Next day went to office as usual and after some walk the pain has still grown and got swollen too. Got checked with Apollo clinic and it seems to be a ligament tear and had to take complete rest for a week and 2-3 more weeks of rest for it to be able to walk again. Hurt but not Retired. Looking for the next trip . Having abandoned BSNL landline broadband connection ( in tirunelveli ) i was franticaly looking for alternatives. Though there were few wired options available ( airtel etc) i looked for a wireless option as i could carry it any wherever i travel. Wireless broadband was hard to find by as 3G / BWA spectrum was allocated only this month. The only carrier providing 3G based datacards was BSNL and once again i was at their mercy :(. What would you expect when a corporate has monopoly over a business. Conventional wisdom states that they should boast thier monopoly and penetrate market with their service before competitors steps in , availing themselves a strong first mover advantage. But any management principle miserably fails before BSNL. Jus vist their home page bsnl.co.in and you'll get feel of how bad can a website be designed. There was absolutly no clarity on their schemes and how to get a connection. When i tried at thier office in Tirunelveli it was surprise to find that they dont have enough equipment ( usb data card ) on stock. I had to wait for 3 weeks. When it arrived i had to use the recommendation of my relative working there to get the equipment [ ]. It seems they get only few cards every month and they were taken by employes and their relatives. Once the equipment arrived i could get administrative work done in a hour ( atleast they have improved in this area) .Just insert a 3G enabled sim on the card and its up. According to thier website there are 2 types of card one working with 3.1 Mbps and another on 7+ Mbps , but employes were not techicaly capable of understanding the differences. The equipment cost Rs2500 and i have to give deposit of 1500 for a post paid connection.I took a post paid account costing Rs999 + taxes per month for 10 GB download. Data card internaly had a ROM which stored a driver . I was able to install and make the connection up and working in few minutes on my laptop. Speed was pretty okay .I didnt do much speed testing in Tirunelveli.When i carried the card to Bangalore it was working seamlessly without any issues.Speed was good here too.To test the max speed which we can expect on this i tried torrent through it. As torrent algo are designed to make maximum use of the available bandwidth i did it .It gave me almost 350 KB/s which turns out to be 2.8 Mbps which was pretty much fine.I guess the same sim can be used in 3G enabled phone for video calls, mobile browing etc but i havnt tried it . There is no clarity on if the same equipment can be used a across different carriers ( when they are availble ).I am also not sure of roaming charges , Jus waiting for the first bill to confirm things. There is no online login to check the usage amount . Driver some with a screen which shows the usage but its not accurate . After downloading a movie of size 700MB and after 1 month of usage it showing the total usage as 529 MB. If you are higly mobile you can get this connection else you can wait for a couple of months when schmes from mulitple 3G playes/ Broadband wireless access player will pour in which will you lot of options to chose from . PS: I am personally interested in the pricing point when Reliance Industries comes with their schemes.Its going to be destructive for current playes ( BSNL , Airtel etc) but will be constructive for endusers.